Homemade Bean Soup Mix – For Eating or Decoration! A few months ago, I made my own Bean Soup Mix. I layered the beans in a jar, intending to mix them up and use them to make soup with. You can use any dried beans that you like. There are so many varieties of beans available in stores now. I actually had several more kinds of beans to use, but ran out of room in the jar! To make, simply layer in the beans in whatever quantity or thickness of layer that you want. Use more of your favorite beans, and less of the beans that aren’t your favorites. If your making this for a decoration, you can use the color of beans that you want, layering to get the decorative effect your looking for. Now, if your going to cook these, roll the jar around to mix the beans. Or you can mix the beans in a large bowl or pan, then pour into a storage container. To cook, just soak the beans overnight and cook like you normally cook beans. When you buy a dried mixed bean soup mix in the store, it comes with a little seasoning packet. You don’t want to use those. They are very high in sodium. It is so easy to season your own beans that you won’t even miss the little packets. You can get many more flavor combinations if you season the beans yourself. First, you can add whatever meat you want, or no meat at all. A ham bone is popular to cook with the beans. I also like to use cooked hamburger in my soup. Keilbasa or any kind of sausage is delicious in bean soup. If you cook the hamburger and sausage before adding to the soup, you can drain off a lot of the fat. Instead of eating it. Once you have you meat in, add garlic and onions to taste. You can add any kind of peppers, also, if you like. You can use fresh, or garlic and onion powders. Add black pepper and Chili Powder for additional flavor. If you want a more Mexican flavored soup, add some Cumin, too. The measurements for all these seasonings will vary according to how many beans you’re using. Taste as you go along. The very last thing to add is salt. Add according to your taste. You want to make sure you add the salt after cooking the beans. Salt can cause the beans to stay hard if added at the beginning of cooking. I often add a large can of diced tomatoes at the end of cooking as well. Add the juice or drain, depending on how “soupy” you want your soup to be. Add the tomatoes at the end of cooking. Tomatoes can also cause beans to stay hard if added at the beginning. 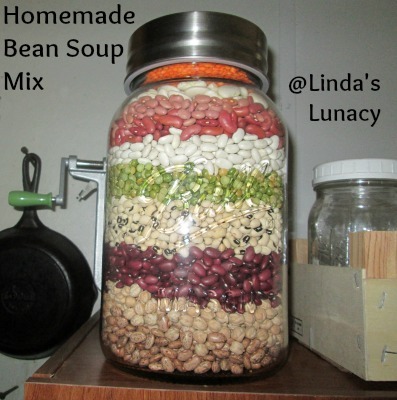 Once I had my beans layered in the jar pictured above, I set it on top of my pantry cabinet. I meant to come back and mix them up. Except I kept looking at it every time I walked by. And I liked what I saw. So there it sits, decorating my dining room instead of getting eaten. lol If you were to buy a ready made jar like this, it would cost a lot more than making it yourself. I just love my jar. And I get many compliments on it from guests.